A 50-year-old woman with no significant past medical or surgical history presented to the clinic for living donor liver evaluation. As part of our institutional protocol, she received standard blood tests and magnetic resonance imaging. In addition, an ultrasound-guided biopsy was performed due to her age to rule out any associated pathology. The biopsy was performed with an 18-gauge Biopense needle to obtain a core sample of liver, with one pass, and no complications were noted following the procedure. No histopathologic diagnosis was found on the liver biopsy. Imaging demonstrated a noncirrhotic liver, conventional hepatic arterial anatomy, trifurcation of intrahepatic bile ducts, fat quantification of 4.2% to 4.7%, and an adequate liver volume (Figure 1). She was deemed an appropriate living donor candidate and underwent an exploratory laparotomy, cholecystectomy, and intraoperative cholangiogram. 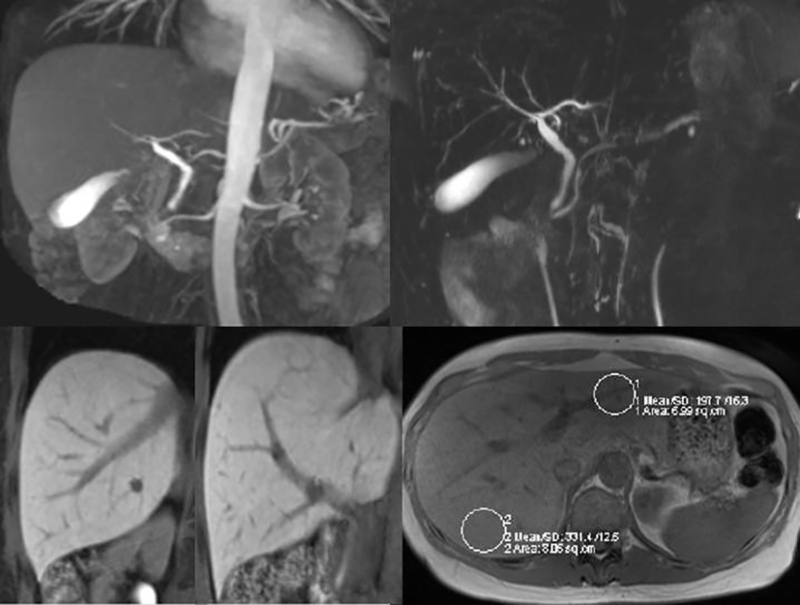 The intraoperative cholangiogram demonstrated reflux of contrast from the right posterior hepatic duct into the adjacent liver parenchyma and subsequent appearance of the contrast in an adjacent peripheral right hepatic vein branch (Figure 2). 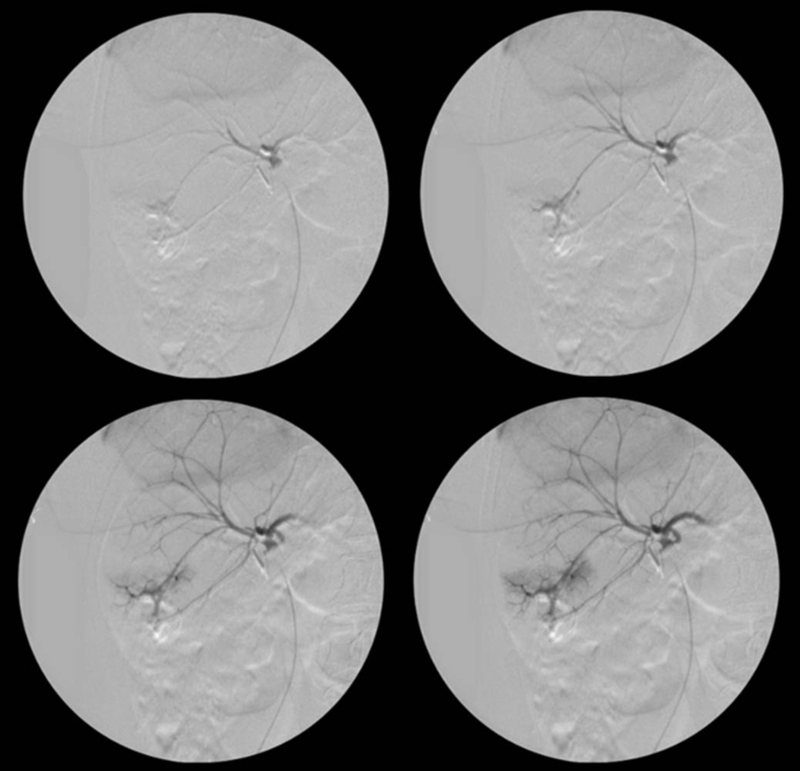 A repeat cholangiogram demonstrated a similar finding, with slightly decreased flow of contrast into the right hepatic vein branch (Figure 3). A number of case reports and case series have demonstrated the clinical consequences of a liver biopsy for the donor, including hepatic vein to portal vein fistulas, hepatic vein–biliary fistulas, hepatic artery to portal vein fistulas, and hepatic hematomas. Biliary venous fistulas may result in recurrent bacteremia, jaundice, hemobilia, bilihemia, anemia, fever, liver failure, and death.1-12 In rare cases, patients suffer from bilirubinuria with subsequent cholemic nephrosis and renal failure.3,5 The majority of biliary-venous fistulas are not clinically apparent and do not require treatment, but symptomatic patients may require assessment with cholangiography or arteriography with subsequent procedures. In living donor candidates, care must be taken to minimize or eliminate any adverse effects of donation. A determination should be made regarding the use of percutaneous liver biopsy in donor evaluation, which may result in serious clinical consequences for both parties. Although these biopsies can provide helpful information, the serious consequences of resulting complications should lead to reconsideration of the requirement for percutaneous liver biopsy in living donor candidates — or at least strict scrutiny about the candidates for whom biopsies are deemed essential. Percutaneous liver biopsy is included in living donor candidate evaluations in many institutional protocols. However, this invasive procedure is not without complications. This report details a case of a living donor candidate who underwent a percutaneous liver biopsy that resulted in an asymptomatic biliary-hepatic vein fistula, discovered at the time of operation. Nagral A, Waravdekar G, Nisar P, et al. Transjugular liver biopsy—experience in fifty patients. Indian J Gastroenterol. 2003;22(5):173-175. Jawaid Q, Saeed ZA, Di Bisceglie AM, et al. Biliary-venous fistula complicating transjugular intrahepatic portosystemic shunt presenting with recurrent bacteremia, jaundice, anemia and fever. Am J Transplant. 2003;3(12):1604-1607. Ball TJ, Mutchnik MG, Cohen GM, Burrell M. Hemobilia following percutaneous liver biopsy. Gastroenterology. 1975;68(5 Pt 1):1297-1299. Dommergues JP, Valayer J, Vedrenne J, Alagille D. Portal vein injury and biliary fistula: Complications of a liver needle biopsy in an infant. Arch Fr Pediatr. 1972;29(3):325-329. Maxeiner H. Iatrogenic biliovenous fistula. Z Rechtsmed. 1984;91(3):235-246. De Santis M, Alborino S. Hemobilia due to a portobiliary fistula as a complication of a fine-needle liver biopsy. Radiol Med. 1996;91(4):482-485. Verhille MS, Muñoz SJ. Acute biliary-vascular fistula following needle aspiration of the liver. Gastroenterology. 1991;101(6):1731-1733. Weintraub JL, Hawari A, English B, Mobley D. Treatment of a biliary-venous fistula following percutaneous biopsy in a pediatric living related liver transplant patient. Pediatr Radiol. 2006;36(6):555-557. Otobe Y, Hashimoto T, Shimizu Y, et al. Formation of a fatal arterioportal fistula following needle liver biopsy in a child with a living-related liver transplant: Report of a case. Surg Today. 1995; 25(10):916-919. Gabriel S, Maroney TP, Ringe BH. Hepatic artery-portal vein fistula formation after percutaneous liver biopsy in a living liver donor. Transplant Proc. 2007;39(5):1707-1709. Sears RJ, Ishitani MB, Bickston SJ. Endoscopic diagnosis and therapy of a case of bilhemia after percutaneous liver biopsy. Gastrointest Endosc. 1997;46(3):276-279. Patel RI, Shapiro MJ. Biliary venous fistula: an unusual complication of fine-needle aspiration biopsy of the liver. J Vasc Interv Radiol. 1995;6(6):953-956. Fernandez H, Kim PTW, Goldstein R, Testa G. Biliary-hepatic vein fistula in a living donor liver candidate. Appl Radiol. 2016;45(12):38-39. Prepared by Dr. Fernandez while a Transplant Surgeon; Dr. Kim while Assistant Director of Living Donor Liver Transplantation and Surgical Director of the Neuroendocrine Tumor Center; Dr. Goldstein while Medical Director of the Liver and Pancreas Disease Center and Assistant Director of Simmons Transplant Institute; and Dr. Testa while Surgical Director of Living Donor Liver Transplantation at Baylor University Medical Center, Dallas, Texas.